One of the scariest piles of junk you could ever imagine is a burning pile of tires. Not only does something like that release toxic fumes but it can burn for days and weeks without an end in sight. As a rule, junk yards can also be rather scary especially at night. You might also have some scary junk items around your home. They might not be a perilous as a pile of burning tires but an old water heater or washer down in the basement or a recliner that is stuck in recline can be downright scary. Those are the kinds of items that won’t be a problem for Junk King Birmingham to deal with. With Junk King on the job, you can be assured that whatever scary junk you want to get rid of will be removed very efficiently and quickly. 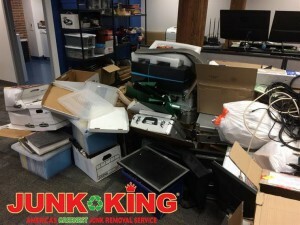 If you call Junk King today to set up your appointment, then there is a high likelihood that your junk will be cleared out by the following day. If you would prefer to get the items hauled away on a weekend, then you can lock down that time and date, too. You’re going to find that Junk King can be extremely accommodating. Since the Junk King crew is going to be doing all the work for you, the scary junk you want to get rid of can literally be anywhere on your property. They crews won’t have any issues going up into the attic or down into the basement. They also have been known to crawl under porches to get at stuff. Weight, size or the “grime factor” won’t be an issue for the Junk King squad! As for the cost, you can get an estimate of the price range by using the online pricing estimator. But that final fee can’t be locked down until the crew has had a chance to look over everything for themselves. They’ll be judging the items on how it can get packed onto the truck and not by the weight. Clearing out the scary junk from your home and yards is never a problem for the team from Junk King Birmingham. Put them on the task today! This entry was posted in Birmingham Junk Removal and tagged Junk King, junk removal, scary junk on October 31, 2018 by Junk King. Last updated October 31, 2018 .